I Came to Picnic: Eggplant & Sun-Dried Tomato Spread – Eat Me. Drink Me. When the sun is shining and the weather balmy, I enjoy nothing more than packing a picnic basket and a blanket and heading into the great outdoors to eat. I love eating outside, and since the sun has been generous this summer, we’ve had dinner outside almost every day. There’s something special, however, about a picnic. A picnic requires planning, preparation, and packing. First, you must decide where to go and what to make. You have to decide whether you’ll be close enough to transport warm food or if your brie will melt before you get where you’re going. You have to figure out how many utensils and napkins you’ll need, since you can’t just run back to the house to grab them, or which container will work best to sneak red wine into the 4th of July Celebration in Washington DC. Putting together a picnic basket is one of my favorite pastimes. Much of this is probably due to my love of cheese and cheese’s conduciveness to being transported in a basket. But there are a number of other delicious dishes that lend themselves to picnicking – some that aren’t specifically intended for such a meal. A few weeks ago, Dickinson College (right around the corner from my house) hosted its annual Bluegrass on the Grass festival. 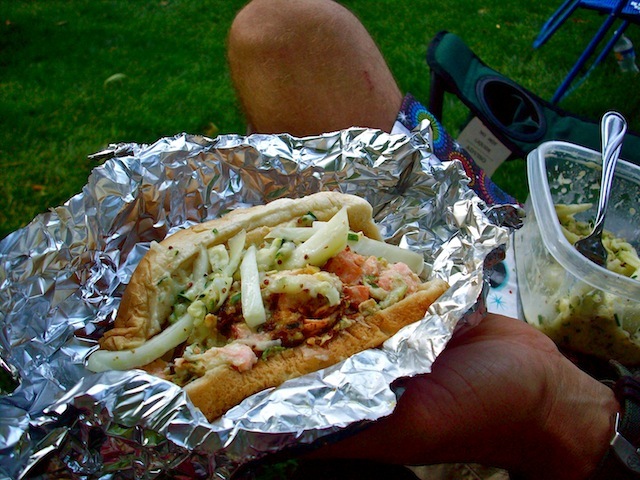 My dad packed up our lawn chairs while I modified a dinner of salmon cakes with fennel slaw for transportation. I think I’ve mentioned before that I’m not very good at frying things (a great loss), so my salmon patties were less patties than hunks of salmon spiced with lemon, chives, and cayenne and threaded through with grated zucchini. All for the best, however, since this made them easy to stuff into buns then packed tightly in aluminum foil to retain heat. I packed the fennel slaw with grainy mustard, mayonnaise, and more lemon in a Tupperware and then threw some Ritz crackers, brie, and leftover chocolate-marshmallow no-bake bars in the basket for good measure. A delicious picnic, I might say, accented by bluegrass plunking through the warm night. Even the rustling wind preceding rain turned into a friendly shake as we sipped hot, milky coffee out of a thermos. Around us, hundreds of other happy eaters with bins of pretzels, take-out Thai, or ham sandwiches swayed in time to Cats in the Skillet until the first fat raindrops began to fall. Picnics don’t have to be in the midst of a crowd or backed by music or be complicated in order to be delightful. One of my favorite picnics involved a peanut butter and jelly sandwich, an apple, and some string cheese. An old friend, who I don’t see often, and I were hiking around one of the trails in Pennsylvania – one that, growing up, I had never known about. We had just climbed past a waterfall to the top of the mountain, and at its peak were a series of cliffs with perfect hand and footholds for bouldering. We’d race each other to the top of different promontories or dare each other to go higher, and then at the summit of one giant rock with a flat, sloping top, we sat in the crisp January sun and looked out over Cumberland Valley, eating the food he’d packed in his backpack. 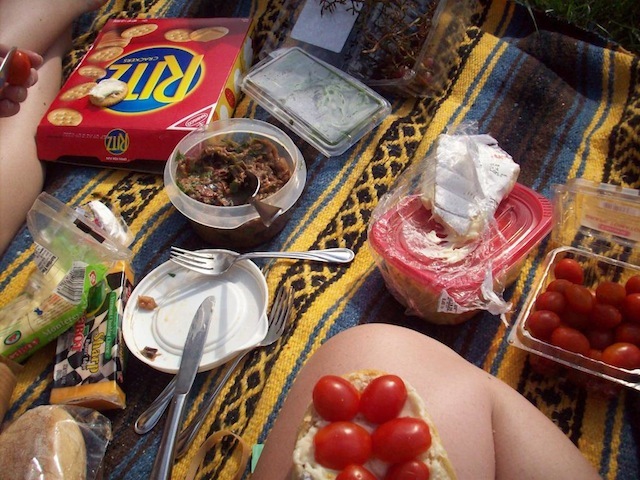 A picnic brings a new dimension to what food already accomplishes – drawing people together. When we experience a change of locale, a new scenery that doesn’t have to be as stunning as a bird’s eye view over the mountains but can be as simple as a big, shady tree, we experience our food in a new way as well. That strawberry is fresher, sweeter, richer. Or perhaps we have just become more aware of its taste because our senses have been heightened by our new surroundings. Vision and taste awakened, we begin to see our picnic partners in a different light as well. We really listen, because our bodies are alert to the changes. We cannot slip into the unremarkable safety of our everyday encounters. Maybe this is a highly romanticized view of eating outdoors. I will accept that criticism. But I will also defend my beliefs that changing our eating routine keeps us aware of what we eat and who we’re with. It keeps our relationships from stagnating. Sandwiches make great picnic centerpieces, and I’ve been doing a lot of sandwich experimenting lately, so there should soon be a blog post with plenty of ideas. If you don’t feel like making whole sandwiches, just pack a baguette, pita, or crackers and bring cheeses, hummus, tapenades, or cold cuts. I like to have snack-y veggies and fruits on hand, like cherry tomatoes, baby carrots, melon, or berries. Small Tupperware containers make it easy to pack coleslaw or potato salad. Other pre-packaged items, such as chips, salsas, and dips are easy sides. Most hot meats will still taste good cold, like chicken wings, baked ham, or turkey. These are great to shred or slice and make into salads or sandwiches. 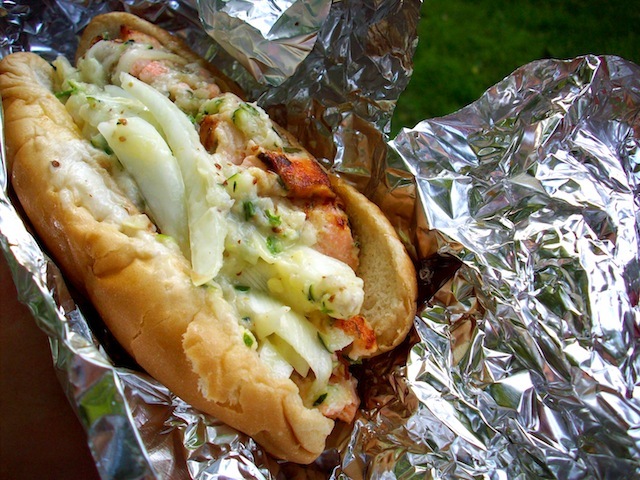 The options really are endless, especially if your destination isn’t too far away, and many entrees can be modified to become picnic-friendly. This is the eggplant tapenade that I made recently for the aforementioned 4th of July celebration in Washington DC. It even got good reviews from a non-eggplant eater. Adapted from Gourmet, July 2009. Preheat oven to 400 with rack in middle. Cut off and discard top of garlic head to expose cloves. Brush with olive oil. Wrap in foil and roast until tender, about 45 min. Cool to warm, then squeeze garlic cloves from skins into a small bowl. Cut eggplant into 1/2 inch pieces and toss with 1 1/12 tsp salt in colander. Let drain 30 minutes. Squeeze eggplant with a kitchen towel to remove liquid. Heat olive oil in a heavy skillet over medium-high heat. Saute eggplant (in batches) until tender. Add eggplant to garlic and mash together. Stir in sun-dried tomatoes, parsley, basil, lemon juice, and 3/4 tsp pepper. Season with salt and drizzle with tomato oil. What delicious pleasures you describe! I’m just waiting for NC weather cool enough for a picnic!